Loopmasters are proud to have joined forces with UMEK, who has created an exclusive 2.7GB collection of royalty free loops and samples which have been made for all producers of Tech House and Techno to enjoy. 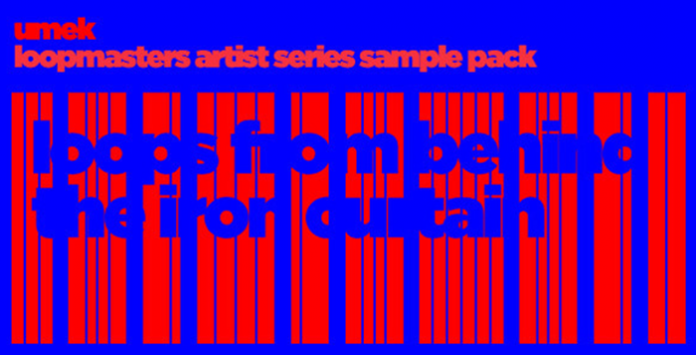 Quite possibly the largest and most comprehensive Techno collection ever offered, Loops From Behind The Iron Curtain sees over 2GB of Royalty Free samples by UMEK including Grimy Bass Lines, Energetic Synth Loops and Driving Rhythm Loops separated into individual drum stems for maximum creative possibilities together with an inspiring collection of single shot and multi sampled instruments with plenty of character. The collection features 1970 production ready samples with 640 loops and 1330 one shot sounds all recorded in 24Bit 44.1Khz quality, 1 bank of 57 Lennar Digital Sylenth Presets containing 13 Bass Sounds, 29 Lead Sounds, 2 Lead Percussion Sounds, 8 Synths and 5 Chord sounds and it doesn’t stop there as also included are 10 Native Instruments Maschine template Projects each with a ready mapped drum kit and a selection of patterns for each one and finally a top secret experimental Reaktor Synth designed, built and used by Umek in his live sets for extra sonic depth. The Slovenian born producer and DJ UMEK has been setting trends and rocking dance floors for two decades now — and still shows no signs of slowing down. He’s tireless in his techno and tech house production and with more than 100 gigs per year, probably one of the busiest techno DJs out there. Having conquered most of world’s biggest stages and festivals, UMEK started his own weekly radio show “Behind the Iron Curtain,” which immediately landed on dozens of the world’s hippest EDM radio stations. In Detail producers should expect to find a 2.73 Gb collection that contains 57 Bass Loops, 140 Synth Loops, 10 Clap Loops, 27 Snare Loops, 32 Hat Loops, 107 Kick Loops, 11 Ride Loops, 256 Top Loops, 13 Multi Sampled Basses, 5 Chord Synth Multi Sampled Instruments, 30 multi Sampled Leads, 7 Synth Multi Sampled Instruments, 50 Drum Fills, 51 SFX Sounds, 98 Drum Hits, 641 Rex2 Files, 10 NI Maschine Projects, 1 NI Reaktor Synth and 57 Sylenth Presets. The Collection is also available in Apple Loop, Ableton Live Pack and Reason Refill formats to purchase separately.